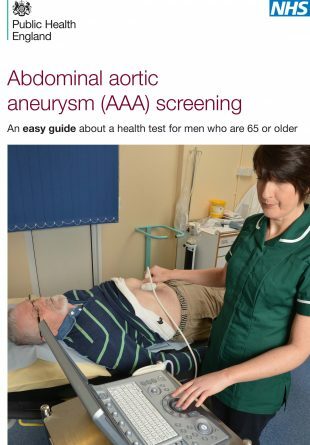 The new easy read version of the abdominal aortic aneurysm (AAA) screening invitation leaflet is available on GOV.UK for local screening providers to download and print out as required. It replaces the previous version, published in 2010, that had become out of date. We developed the updated resource with the help of our national expert group that had previously helped us put together new easy read versions of the Screening tests for you and your baby booklet. The group included learning disability self-advocates (experts by experience), local and national AAA screening staff, learning disability clinicians, commissioners, public health experts and third sector representatives. The input of the self-advocates in particular was invaluable in making sure that the new resource is clear, concise, unambiguous and easy to digest. We hope it will help ensure that men with learning disabilities can make choices about screening that meet their individual needs. All public sector organisations must follow the Accessible Information Standard. This tells organisations how they should make sure people with a learning or sensory disability receive information in formats that they can understand and receive appropriate support to help them to communicate. This includes making sure that people get information in different formats if they need it, such as easy read. PHE Screening has a role nationally in providing information and advice to support local screening providers in meeting this legal obligation. Watch this space over the coming months as we continue to develop new and revised easy read resources for all 11 national NHS screening programmes to meet the standard and meet people’s needs.